It started with a war, as most things do. A war called the Heartland War, which involved the Pro-Life army and the Pro-Choice army. Since neither side won a compromise was made called The Bill of Life in which a human life could not be touched from the moment it was conceived until the child reached 13. From the ages of 13-18 a parent may retroactively ‘abort’ a child. That child was unwound. The technicality was that the child was still kept ‘alive’ by being used as donated parts. 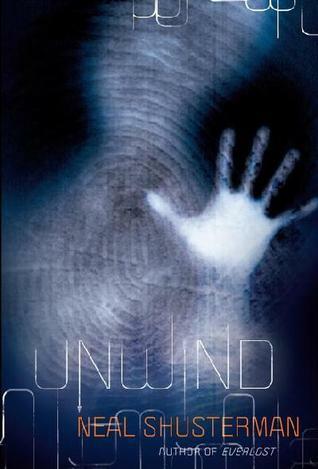 Conner, 16, is a troublemaker, and discovered by accident that he was going to be an unwind. He found that his family booked a vacation but he didn’t find a ticket for himself, he found the unwind orders instead. Risa, 15, a ward of the state with a potentially gifted career as a pianist, discovers that she is to become an unwind due to budget cut backs and having reached her potential, which wasn’t far enough as far as the board was concerned. Lev, 13, knew all of his life that he was to be tithed as an unwind. His family is religious and told Lev that he was chosen by God to be a special gift and he looked forward to his 13th birthday and to go to harvest camp. These three unlikely children come together by accident, two escaping their fate and one a willing candidate going to his, and end up on the run, trying to hold out as long as they can before being captured and send to harvest camp. They meet other runaways, each with their own stories for becoming an unwind and some are sad and scary. This is a very creepy and horrific story and it does it in a way that isn’t gory, it’s more of a psychological horror that grips you. Children retroactively aborted and used for donor parts. Every part of the child is used and so is considered alive but in a divided state. The other part of this story is about the lack of organ donors and how doctors who used to actually try to save lives, now just transplant parts to people willing to pay. While this may sound good in practice, some unwanted side effects occur that no one really thought about. The thought of doing this is the creep factor. You really don’t know what actually goes on in the harvest camps and that is another thought that is planted in your head. The fill in the blank visuals that make you cringe. Kids in the book ask themselves the questions but they don’t really want the answers. There have been cases in real life about people being abducted and having a kidney removed, people selling their kidneys for money. This is a relatively new phenomenon and this book makes you think of the possibilities of how far some people will go. While I did enjoy it, it did bog down in a few places and there is one character in there I wanted to strangle I hated him so much, but over all it is a book that makes you think. This is the first book in the series. Let me start off by saying that this isn’t your normal zombie book. There are no zombies mumbling “brains”, these zombies don’t say much of anything verbally…. Mentally, now there is a different story. 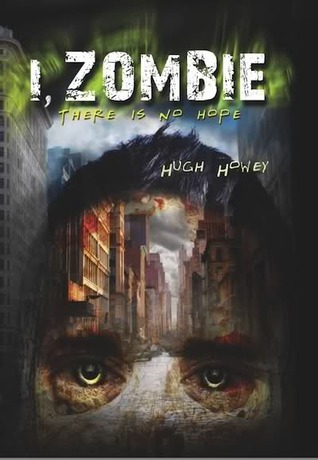 This book is told by various zombies, they are mentally aware of that is going on, but are unable to control their bodies or their never ending hunger much to their disgust and horror. They can feel, think and process the things that they are doing to their fellow man. It’s hard to review as it’s told from many points of view. There are scenes of heartbreak as well as disgust and horror. One pregnant zombie, who was only a few days away from giving birth, is struggling with the baby zombie within her. A mother and child who face a crowd of zombies and a sacrifice has to be made. One of a zombie son locked in with his mother who is paralyzed and the hunger just won’t leave him alone. You get the picture of some of the horrors that await you. There is a story of hope as well that has you cheering on a guy who is in the process of changing into the monster he doesn’t want to become. There is gore in this book, lots of it. There are some moments when you feel bile rising in the back of your throat but it’s so well written that you read on. Sorta like watching a car crash, you can’t help but look. You get dragged along with the zombies and you start to feel for them and the predicament they are in. There is no real beginning, except that some kind of virus caused this, and there is no solid end to this book. It’s a series of stories that tell of a loss of will and humanity. The never ending hunger, the pain and the hopes of a final death that never seem to come. I had to digest what this book meant and what it was supposed to convey to the reader. It whirled in my head for a few days and made me think, something I didn’t expect with this kind of book. Its funny, when I did meet Hugh Howey I told him I enjoyed this book and it made me think….that was a comment he wasn’t expecting.